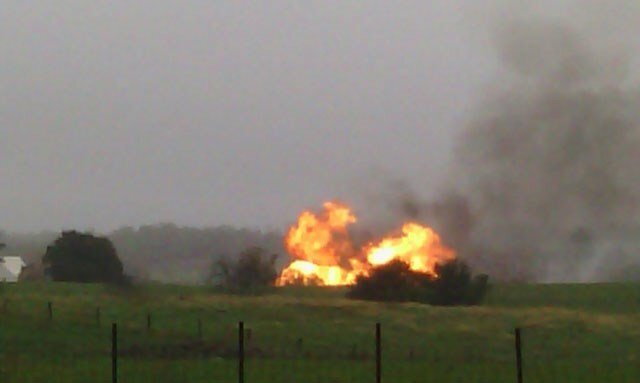 UPATE: At 1:00 p.m. a spokeswoman for Panhandle Eastern, which is a gas company headquartered out of Houston, Vicki Granado, called KMZU and confirmed there was an incident this morning in Johnson County. They initially got the call around 10:13 a.m. Ms. Granado said there were no injuries, and crews were able to get the gas turned off. The fire was able to burn itself out. 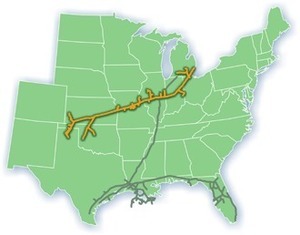 Granado stated that it was an interstate transmission line that pumps gas to all parts of the country and crews were able to re-route the flow. An investigation is being launched into what caused the incident. The pipeline is not a utility line and therefore gas service to residents in the area will not be affected. The area surrounding the fire is secure at this time. Panhandle is the parent company of Florida Gas Transmission (FGT), which has its own string of explosions and other problems, including throwing a pipe across the Florida Turnpike near a high school in 2009. Does that seem like pipeline safety to you? Do you want an even bigger pipeline such as FPL and Spectra Energy’s Sabal Trail or FPL’s Florida Southeast Connection running through your county or state for the profit of a company somewhere else when your tax dollars would have to pay for emergency responses, and your insurance for any damage to your property? I’ve never heard of solar panels leaking or exploding, and they’re cheaper, faster to install, and far cleaner.